We recently held a webinar on Job Store, a revolutionary way to purchase job board advertising from one digital store front inside Xpress. 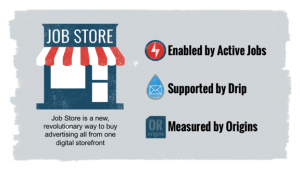 Since Active Jobs plays such an integral role in Job Store – as they do with Tenstreet Market, Pulse, IntelliApp, social sharing, and more – we’ve made them a key focus in our webinar. Active Jobs is a free service that allows you to list your jobs in one place, and have them display in multiple places across the platform. Job Store allows you to add your Active Jobs to a range of job boards and to the Tenstreet Market. Managing postings and job board purchases across multiple, isolated sites is a complex process. To further complicate this already labor-intensive process, attempting to measure attribution is a challenge at best. 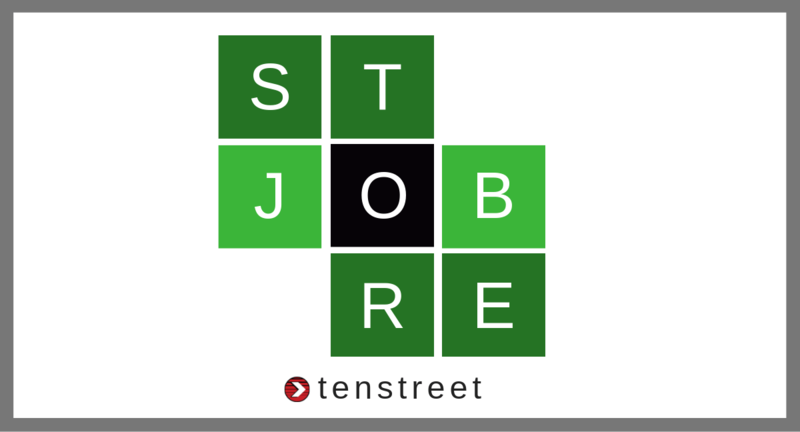 Tenstreet Job Store provides instant relief to this pain point, offering a convenient gateway to popular job boards, Pulse Match, and Tenstreet Market – all from one place. Job Store also works to put your Active Jobs in front of drivers. Enter your Active Job once, and post it to multiple boards and markets in just a couple clicks. Job Store also aligns with other Tenstreet Marketing services, such as Drip, Job Board Scrubber, and Origins to give you a holistic approach to all your advertising and marketing needs. You can find a complete list of all our amazing job boards by visiting the accompanying Job Store Merchants blog. We add more all the time! Job Store offers a one-stop shop for your Full and Partial IntelliApps (through Pulse Match and Tenstreet Market), and lead apps (through popular job boards). Does it cost to setup Active Jobs? No, it’s completely free. Setting up Active Jobs (as well as your Company Profile) is not only free, but highly encouraged as both are visible in multiple places – Pulse, Job Store, Tenstreet Market, IntelliApp, Phone App, social media sharing – with many more to come. Is there a cost for Job Store? No, Job Store is simply a convenient online marketplace that allows you to post the same Active Job to multiple boards and markets in just a couple clicks. The only cost incurred would be for any job board postings you make, or per IntelliApp (when using Pulse Match or Tenstreet Market). What other benefits does Job Store provide outside of giving me one place to make all my orders? What makes Job Store really special is that it serves as a portal to over 90,000 job-seeking drivers a month. Your Active Jobs are placed front and center of a driver – right on their phone through the Driver Pulse app. With this number climbing each month, there’s nothing close to being comparable anywhere in the market. If I update an Active Job, does it automatically reflect in my posting? 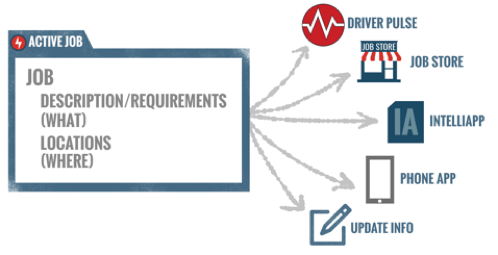 Yes, changes to job descriptions and requirements are automatically updated. We also post updates to job boards, and these are refreshed according to their schedule. What merchants can I order from through Job Store? Today, you can place orders on nearly a dozen job boards, and can always find the most recent list here. We’re actively developing partnerships with other application sources, and will continue to add new markets frequently. Is Job Store practical for smaller carriers that usually need less than 10 drivers at any time? Yes, definitely! To use Tenstreet Market as an example, one beta tester had needs in only two regions. Using Tenstreet Market to target specific, narrow markets yielded excellent results for them. Our other marketing solutions are also perfect for our smaller carriers, and the right combination will depend greatly on carrier need. If an IntelliApp is sent to one carrier through Job Store, is it sent to any other carrier? Absolutely not. Tenstreet finds the best fits based on carrier chosen criteria. These are single-carrier applications that are for that carrier specifically (so you can rest assured the IntelliApp you receive isn’t being shared with any other carrier). How much do you charge for pay-per-app in IntelliApp? That depends on the posting, the market, and the amount of coverage you’re purchasing. In Job Store, the new Tenstreet Market estimates your cost on anticipated applications received. But don’t worry, you only actually pay for the applications you receive. Can you tell when an IntelliApp comes in specific to a campaign? Absolutely. 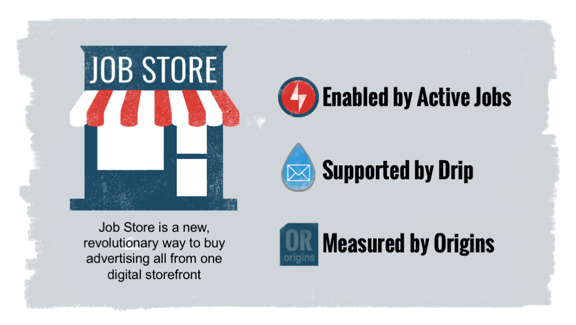 Job Store purchases can be measured by Origins, which measures the origins of your spending, and allows you to make more educated purchasing decisions in the future. You’ll always know just what campaign deserves the credit for any particular IntelliApp. The Job Store tool will give you access to your current campaigns with details, performance statistics, upcoming orders, and more. It also lets you see past month performances and costs. Do I have to order all the Jobs in Active Jobs, or just the ones I want? You are in control of which jobs to advertise. You also are in control of the locations in which you wish to advertise. We ensure you are clear on both by displaying your purchases on an interactive, color-coded map, before you actually make the purchase. I’m not using Origins; can I still access my results? Yes. Accessible from your dashboard and delivered to your inbox, your Performance Report takes advantage of some of the machinery behind Origins. Tracking how many and of which type of application received per Active Job listed, the performance report also provides line-item and aggregate totals for all of your ad spend. How does the pay-per-app approach work? For Pulse Match and Tenstreet Market, just set your budget, and pre-pay each month. When posting your job through Pulse Match, you’ll pay a low, introductory rate of $30 per IntelliApp. For Tenstreet Market, you’ll pay $50-$80 per IntelliApp, depending on which order option you pick (good, better, best) and geography. For Job Boards, the price depends on the job board, posting, and package purchased. Will my orders automatically recur? Keep the ‘Recurring’ checkbox checked, and the system will automatically renew your order each month. If you would like to cancel an order for the upcoming month, uncheck the ‘Recurring’ checkbox, at least five days before the month’s end. 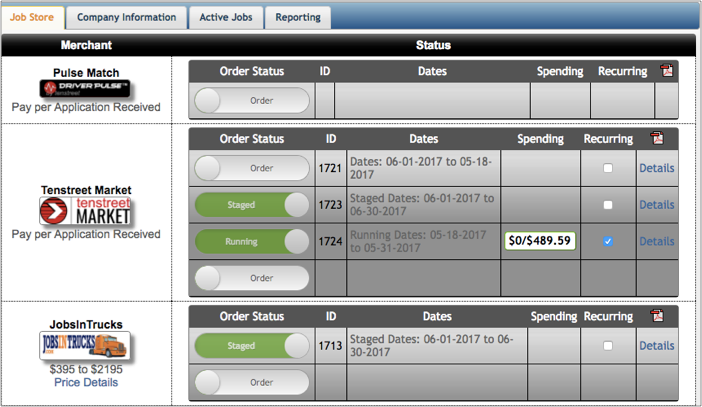 You’ll be able to easily see which orders are set to automatically renew, as the jobs will appear highlighted on your Performance Report. Can you create an order for a future period in time? Yes! We’ve recently added the ability to add an order for a future period as well, to help keep things from falling off your already full plate. Yes, with Pulse Match and Tenstreet Market. Once a job is posted to a job board, we would be unable to cancel your order for that month, and would advise you to reach out to that particular merchant to cancel. Should I place all my jobs in one order? With monthly subscriptions, you would want to place all of your jobs in one order. With Pulse Match and Tenstreet Market, it’s simply a personal preference – some shoppers like to place several orders so they can manage them independently. Please contact your advisor or sales@tenstreet.com today – we’re looking forward to talking with you! Ready to Learn More About Job Store?